Happy Monday Guys! When I was asked to design a Florida Room for Douglas Elliman I instantly thought of color and bright! 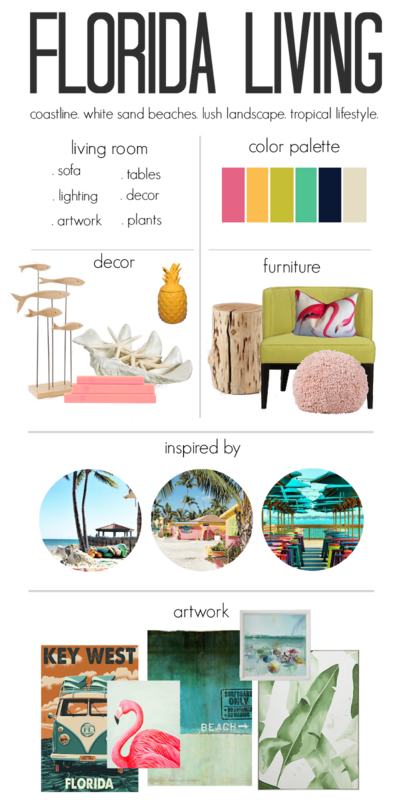 I googled and searched and shopped my favorite stores to design a Florida Room I would want to lounge in, visit with girlfriends in and watch my little people play in. I love everything beachy even if the ocean isn't in sight. The summery feel of a room filled with artwork, neutral colors and bright choices of decor is my idea of the perfect room. When I am envisioning a space filled with furniture, decor and soon to be memories I always start with the sofa! Usually it's the focal piece in your living room, you lounge on it, snuggle on it, watch the Bachelor on it, etc. so that's where I like to start. When I was gathering images of Florida, everything was simple, clean lines and bright! All of my favorites from decorating to throwing a birthday party. I love the size of the couch I found at Crate and Barrel and the color has a very beachy color. Next I like to look for what I want the room to say (in this case, Florida Style) ... that's where the artwork comes in. I love the pieces I found and would hang them above the sofa in a gallery wall style. I would choose an accent wall and use this removable wallpaper with a few (probably three large) black and white family pictures of our time at the beach! In our place right now, that would be the staircase wall and it would bring so much life to the space and not to mention that print is my favorite! I found this green (citron) chair which gave me the bold color I was looking for. 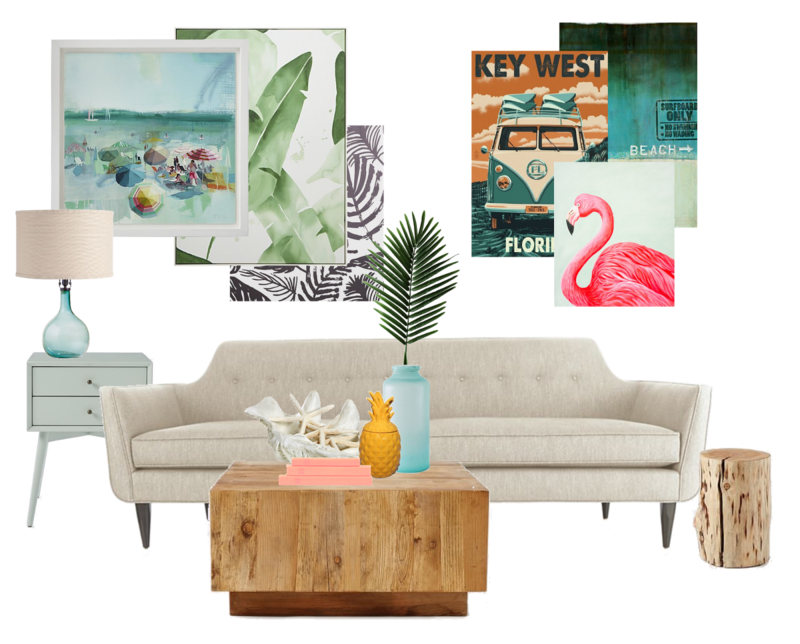 The side table and coffee table are exactly what a beachy room needs. Wood brings the outdoors in, which is ideal for any room really. It literally brings the whole look together, I think! The coffee table is big enough you can add decor to bring your personal style. I grabbed the end table, which is designed as a nightstand and I say go for it, put it in your living room! I love the color, the style and it doesn't have to just go in the bedroom! Don't be afraid of being bold! Be unique, colorful and its your house so you have to love it! The double drawers are perfect for the remotes and a few toys for my two little people! The table lamp is made out of glass wich definitely feels beachy to me, the color helps too. Currently I am loving the layered rug style, aren't you?! A bright fun rug with a soft sheepskin layered under the accent chair or your favorite part of the sofa. I would never leave this room, ever! The best part creating a space is decorating. It literally takes me forever to find the right decor but when I do I absolutely love it! Tropical leaves are so popular right now and I couldn't be more obsessed. Adds a little greenery to the room and it fits right in with our beachy theme! Filling jars, giant seashells or glass fish with seashells is another way to bring the beach indoors! Every time we go to the beach we are always looking for that on perfect piece of treasure to add to our collection. Aren't you just loving that yellow pineapple? Adie would definitely be hiding everything in there. Tabletop books are another favorite of mine to keep on the coffee/side table, I currently have this San Francisco one from Anthropolgie and love it, makes me want to plan a vacation. 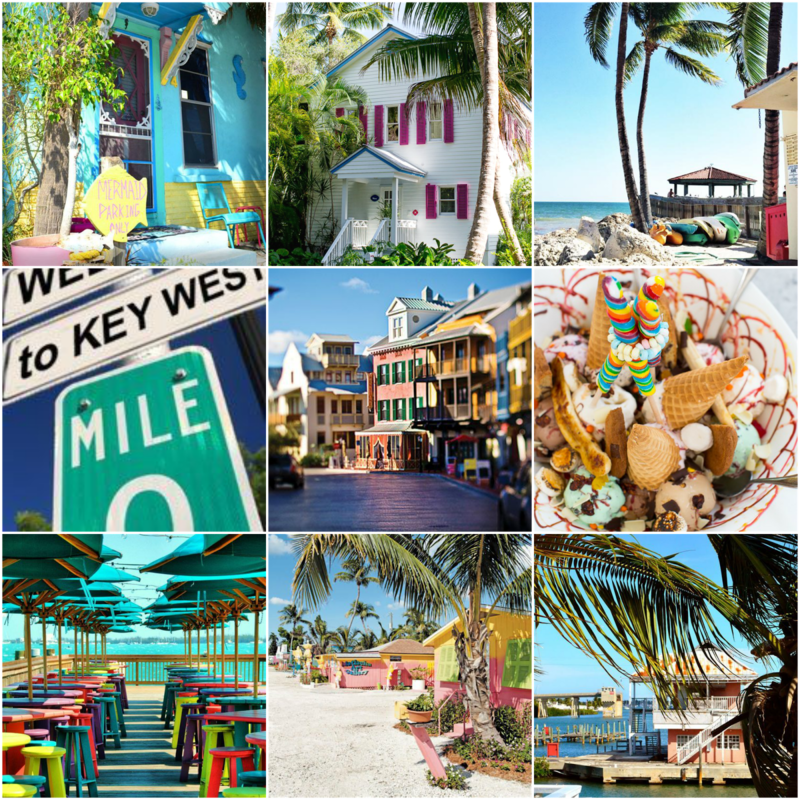 If you are looking for some beachy inspiration check out Douglas Elliman's Florida page!